Lenovo intends to attract attention of the very big number of potential customers in the low price category by the launch of the Thinkpad SL series. 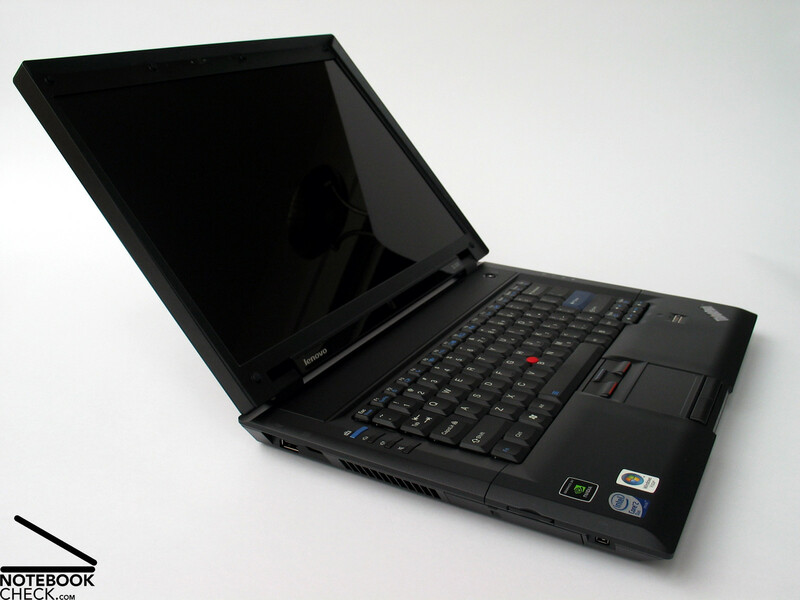 Thereby, the SL models should offer the successful Thinkpad qualities at an attractive entry level price, which makes it affordable for everyone. Overall, the SL series approaches the consumer sector. 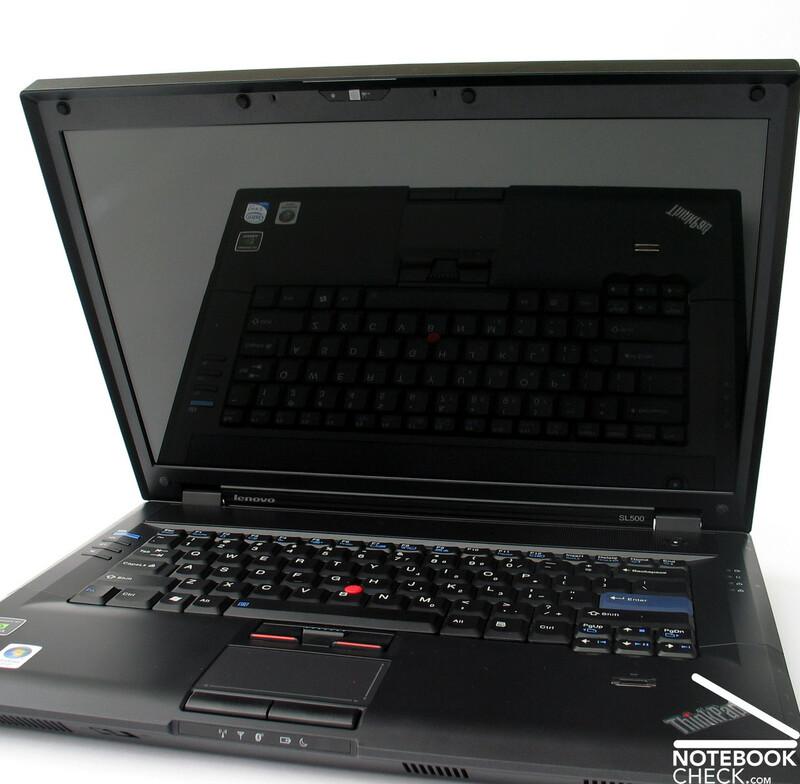 After testing the compact 14 inch notebook of the SL series, the Lenovo Thinkpad SL400, we now look at the bigger 15 inch colleague, the SL500, in this review. In total Lenovo offers the new SL notebooks in three different sizes: SL500 - 15.4 inch, SL400 - 14.1 inch, and SL300 - 13.3 inch screen diagonal. How can the as such worthy Thinkpad Business notebook get closer to the consumer market without completely differing from the design properties of the business models? Right, by high-gloss surfaces. At least this was also the idea of Lenovo's creatives. The result: A black finished display lid in piano look, which is usually only for models not designed for business. This is not a surprise, because this high-gloss surfaces are usually very sensitive to signs of wear and tear like scratches and stress marks. Especially if a notebook is predominantly used on-the move, this is a fact that should not be neglected. Another problem, which is not that crucial, is that the high-gloss surfaces are sensitive to dirt. If you do not work with your velveteen gloves on, unappetising fingerprints and many highly visible dust particles are unavoidable. The only thing you can do is to clean them frequently with a slightly wet and clean cloth, or even better with a micro-fibre cloth. The Thinkpad logo on the display lid has a red LED instead of the dot on the i. This especially attracts attention in a little bit darkened indoor rooms. So, the new SL series has a property, which former Thinkpad models consistently abstained from. That is being an offensive eye-catcher. This is self-explanatory, because one would not like envious glances at somebodies notebook in the office. Also the shape of the case differs essentially from the 'genuine' business models by Lenovo. While these have simple and worthy shapes, the SL500 has a nearly agressive v formation, which lets this notebook with a height of above 40 mm look clearly more agile and slimmer than it actually is. 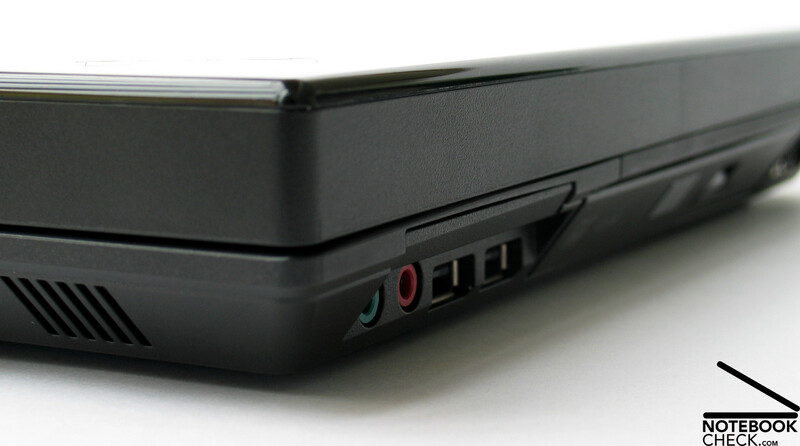 Unfortunately this has a negative impact on the offered ports, which again distinguishes the SL500 from the other Thinkpad models. You can read more about this in the connectivity section. 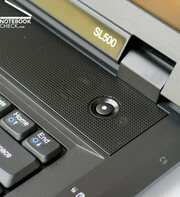 The SL500 offers the usual Thinkpad qualities in terms of stability of the case. On the top side and on the bottom side of the base unit, it is very resistant against punctual force. Even the display in high-gloss look is no exception in this aspect. The role of materials has been obviously exchanged compared to the T series. The trough of the SL500'S case is made of plastics, while the palm rest areas are made of a metallic material. However, a not visible metal frame inside, which connects all parts firmly to each other, makes this notebook very flexural rigid. Creaking noises while handling this notebook could not be heard. 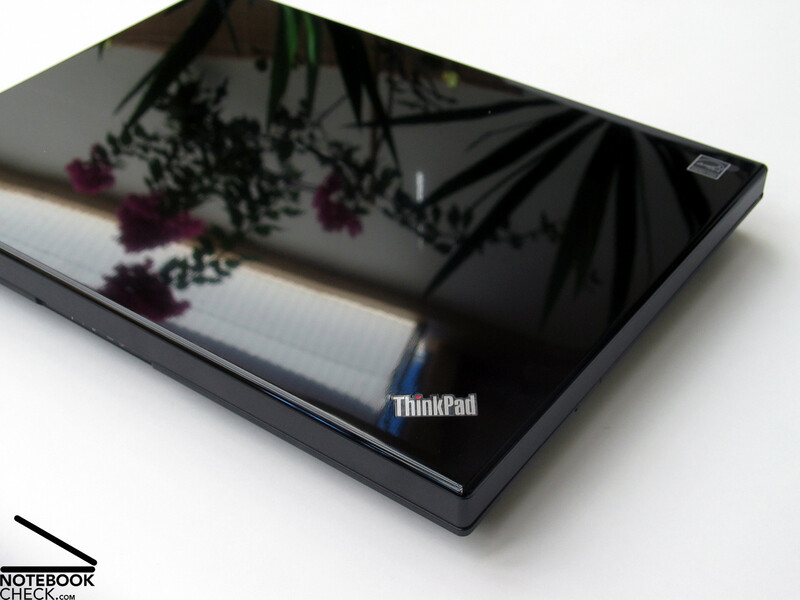 Alike its colleagues, also the Thinkpad SL500 is equipped with a relatively clearly shaped Clamshell design of the display. If closed, it folds with the base unit, and is so able to well cushion shocks in case it falls. The hinges were also a little bit redesigned, but are still made of a metallic alloy and are able to steady the display. 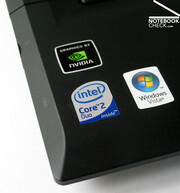 However, this notebook does not have a transport hook, which would secure the display if closed. This is solely up to the hinges. The main problem of the location of the offered interfaces is, alike with the already reviewed SL400, the shape of the case. The flanks are wedge-shaped towards the back, so, the interfaces are rather hidden and difficult to access. E.g., if you want to connect a simple USB jack into one of the designated ports, you either need to bend down and move your head close to the table board or lift the notebook from the table. It's up to the user, which of these methods is finally more elegant. Not only the look, also the connectivity is more consumer like than business-like. 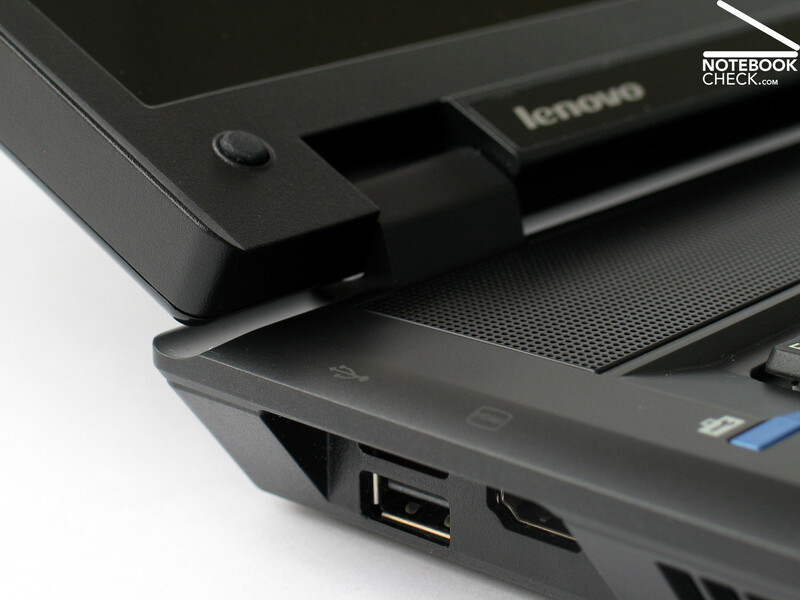 E.g., Lenovo did not include a docking port, which would be obligatory for a business notebook. 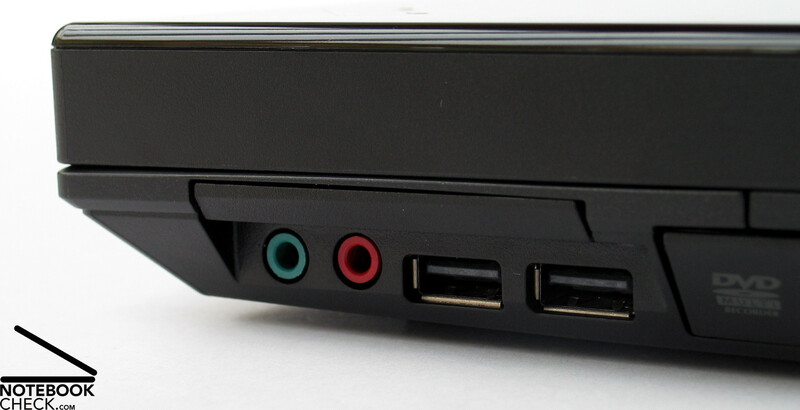 The right side of the case provides the audio ports (headphones and microphone) close to the front and two USB 2.0 ports. 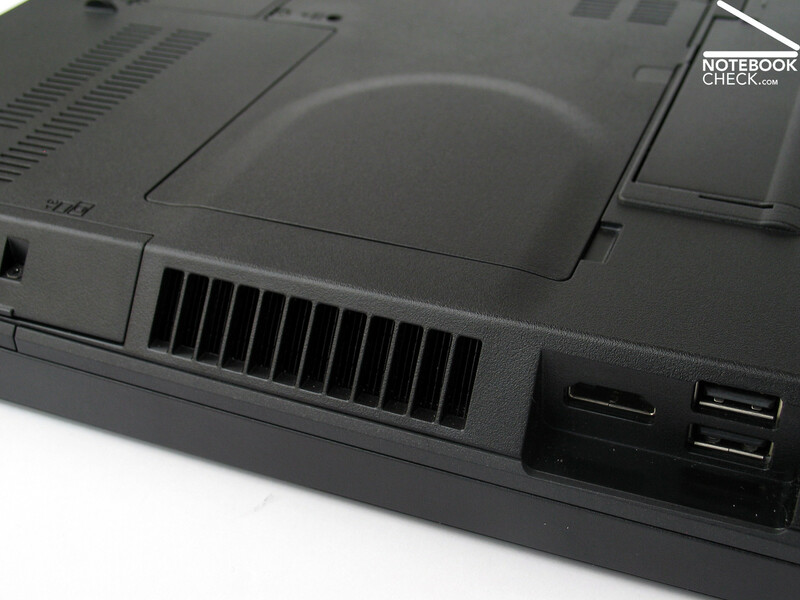 Immediately above these there is the ExpressCard slot. An optical drive follows behind it. Depending on the chosen model, this can also be a Blu-Ray drive. On the right flank, close to the back there are furthermore a modem and a LAN port. The back side of this notebook is much more sparsely populated with interfaces, because the battery occupies most of the available area there. Left of it there is the Kensington lock and the power connector and right of it an analogue VGA out. 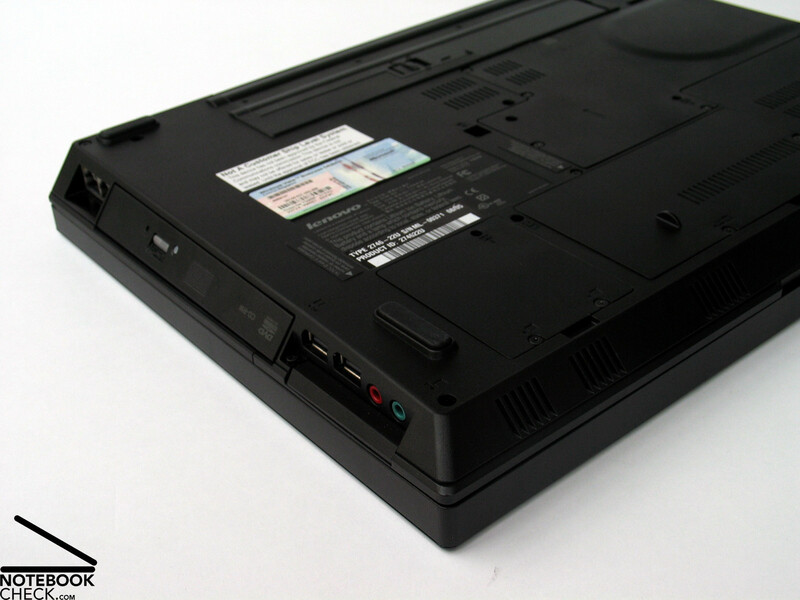 On the left flank towards the back, the Thinkpad SL500 offers two further USB ports and a digital HDMI port for connecting an external screen. Towards the front an SD Cardreader and a FireWire 1394a port follow. The front side is free of interfaces. It only provides a hardware switch for controlling the WLAN module. The location of the ports is thereby absolutely alright. The only trouble is that they can not easily be accessed, because of the shape of the case. If the angle of the wedge-shaped edges would be flatter, it would be already more user-friendly. 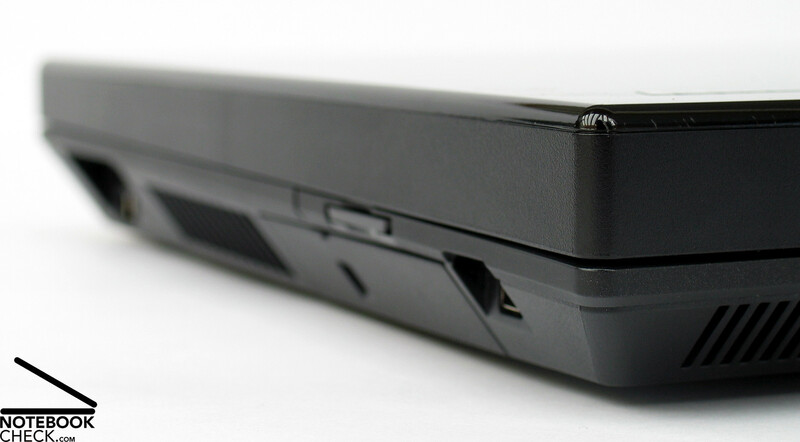 Equipped with Gigabit Ethernet by Realtek and an Intel Wireless WiFi Link 5100 ABGN WLAN module, the Thinkpad SL500 leaves hardly anything to be desired. Therewith the maximum transfer rate of WLAN communcation is 300 Mbps. Also Bluetooth 2.0 belongs to the standard equipment, and this notebook is also prepared for a UMTS module. 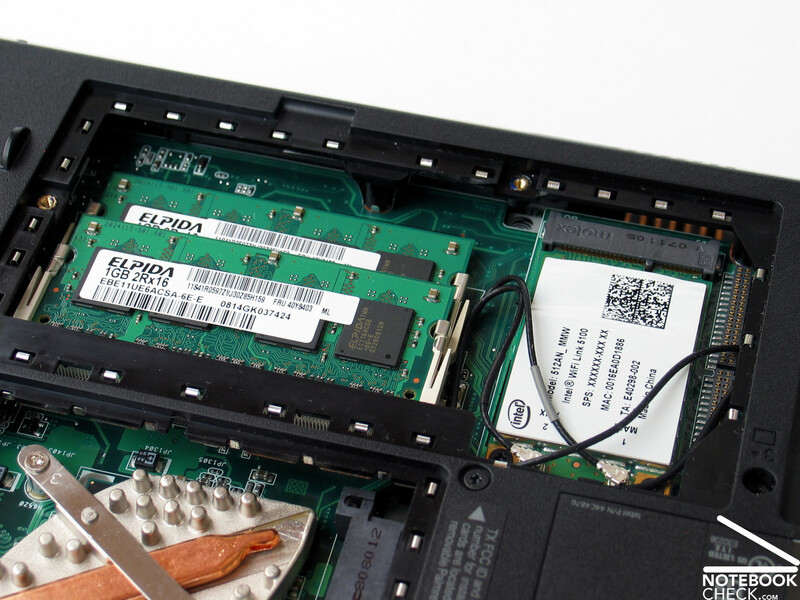 Even if the Thinkpad SL500 belongs to the entry-level notebooks of the Lenovo Thinkpad business series, it provides a number of security features. Furthermore, the optional Secure Business package also includes an enhanced warranty or the possibility of on-line backup of your data. A built-in protection system can detect sudden motions and increases the data security of the data stored on the hard drive. Depending on the chosen options, a fingerprint reader allows an easy and efficient access control to your system. It's in vain to look for a lot of provided accessories. But, the well-known ThinkVantage Tools are included. With these you can quickly and easily change the configuration and settings of your notebook. One of the most important and most popular is, e.g., the Access Connection tool, with which you can manage the network connections. This is ideal, if you constantly need to connect your notebook to different networks. 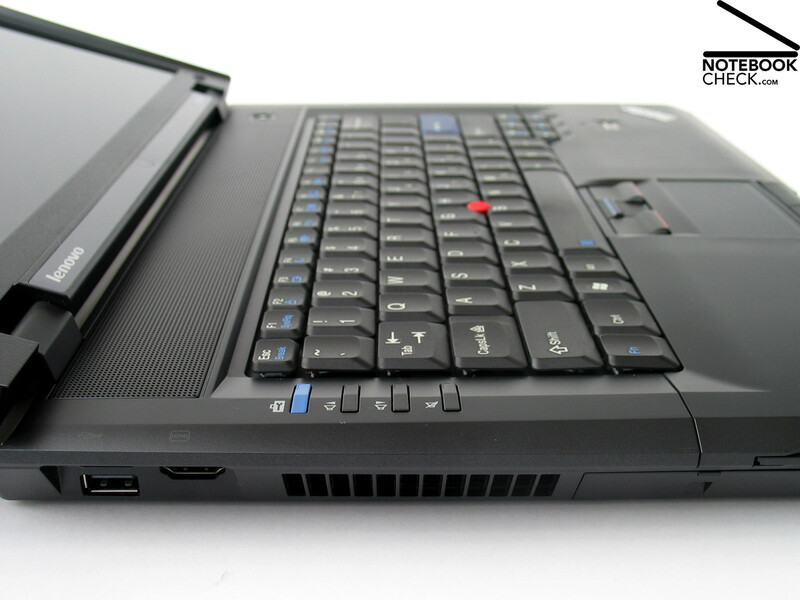 Basically, you find the same keyboard in the Lenovo Thinkpad SL500 as is the SL400. 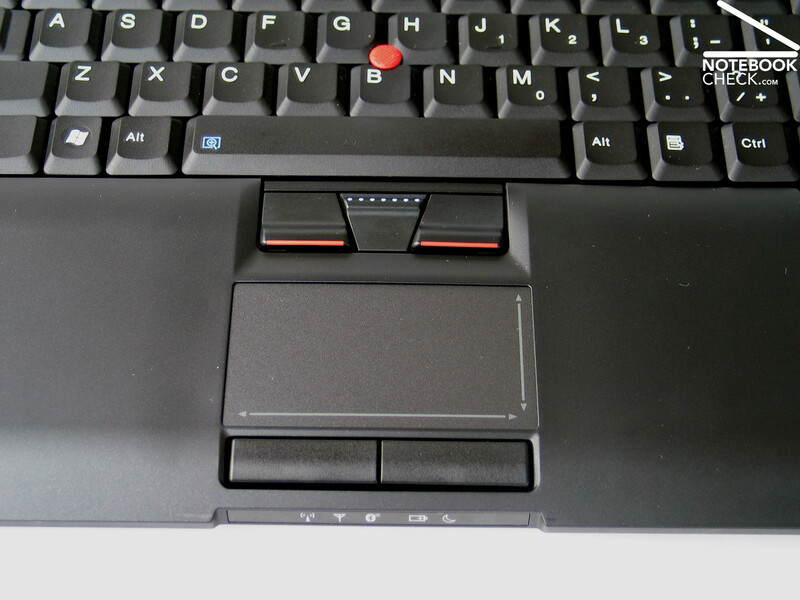 Compared to the other Thinkpad models this basically means that it has an essentially compacter layout without a special grouping of keys belonging together. 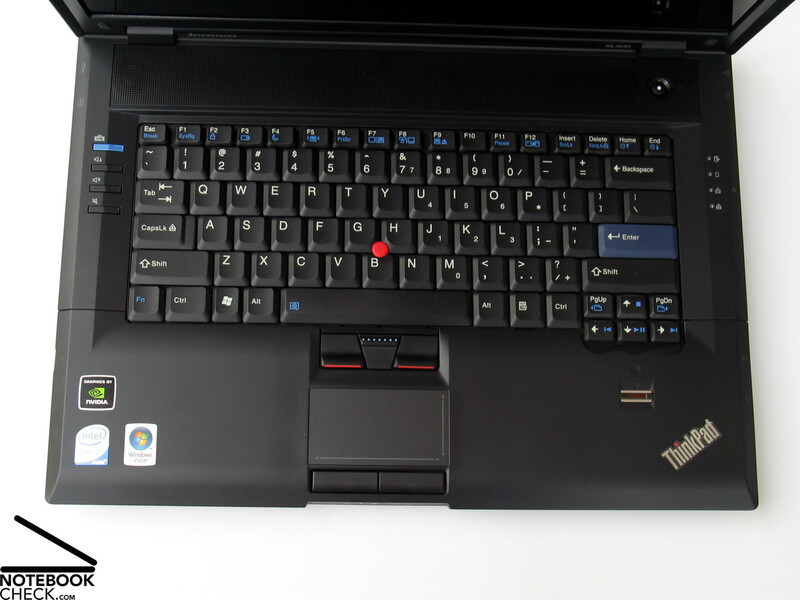 Nevertheless, the order of the keys follow the usual Thinkpad layout. E.g., the FN and the Ctrl are reversely located, and the Del key is at the top right a little bit towards the middle. For those familiar with Thinkpads this should normally not be a problem. But, switchers should count on some time to get used to this layout. Even experienced Thinkpad users might feel that the behavior of this keyboard under pressure is strange. 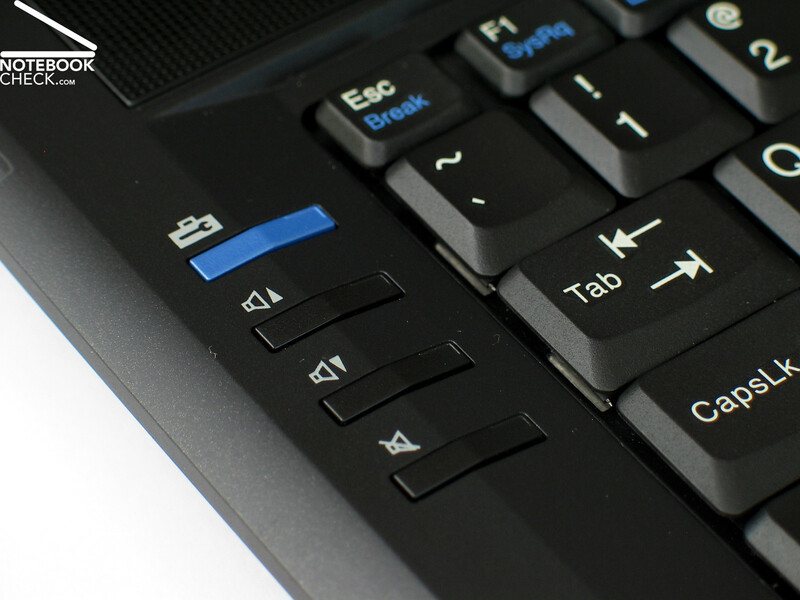 It is possible that the right area of the keyboard, which is above the optical drive, and the left keyboard edge give, if you press against them. At the tabulator, CapsLock, and the Escape key this can even result in a clattering typing noise. Except of this, this keyboard can reach the quality level of the other Thinkpad models. This is true for both the user-friendly feel while typing and the hollow tapping. 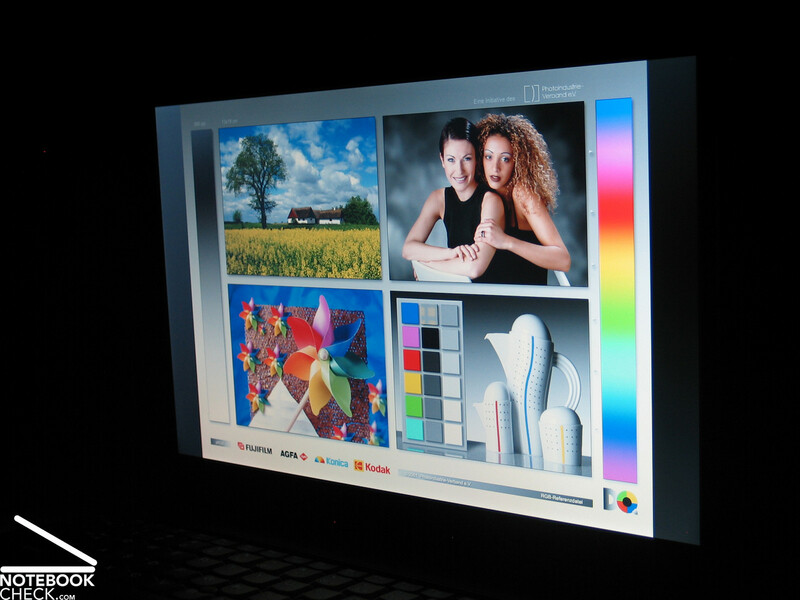 Lenovo currently offers two display versions for the SL500 on its homepage for Germany. On the one hand a 15.4" WXGA panel with a resolution of 1280x800 pixels and on the other hand a WSXGA display with a maximum resolution of 1680x1050 pixels. 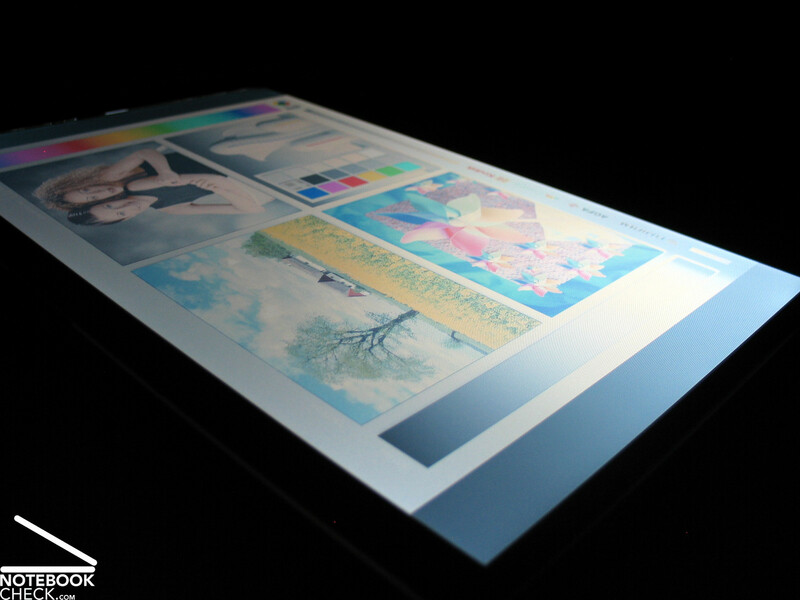 Both panels have a matte 'anti-glare' display surface. In the American market there is also a 'VibrantView' WXGA panel, that is one with a reflecting display surface, available. Our test sample was also equipped with this display version. 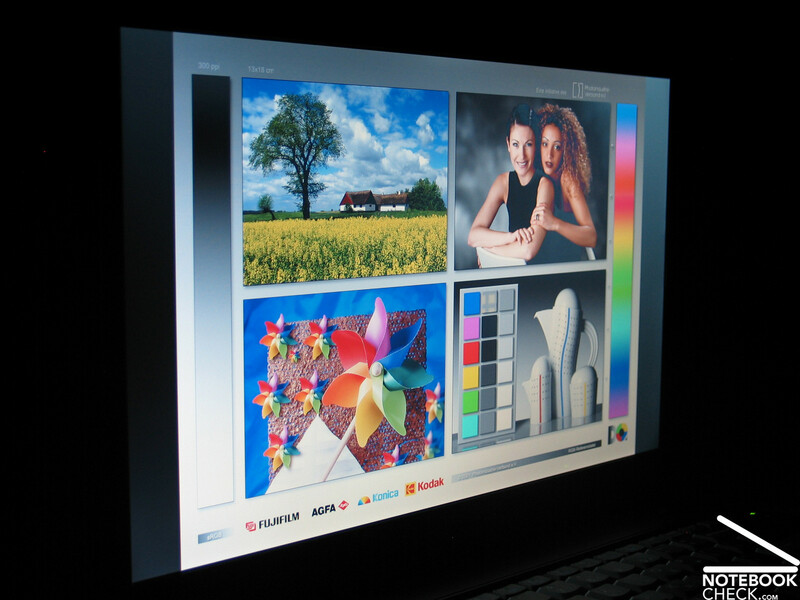 While office oriented users might predominately select one of the matte panels, and we would recommend a WSXGA panel for all those who require a lot of overview, multimedia users might perhaps select the glare-type panel, which is atypical for Thinkpads. In our measurement the WXGA panel with reflecting surfaces achieved a maximum brightness of 210 cd/m². Because the brightness falls relatively clearly down to 166.5 cd/m² in the bottom corners, this panel is only below-average in terms of illumination, which is only 79.3%. 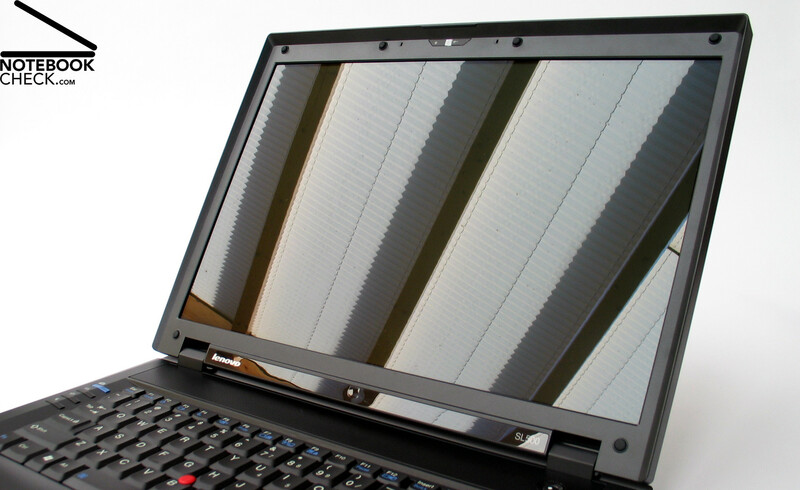 Although one would expect a higher contrast for glare-type panels, this at least does not hold true for the Thinkpad SL500. Due to a very high black value of 1.38 cd/m² the maximum contrast of this WXGA glare-type panel is only 152:1. Nevertheless the colours look strong. The viewing angles of this 15.4 inch WXGA panel are very narrow. If you only deviate a little bit from the ideal vertical viewing angle, there are already clear picture distortions, that is the picture whitens or darkens. 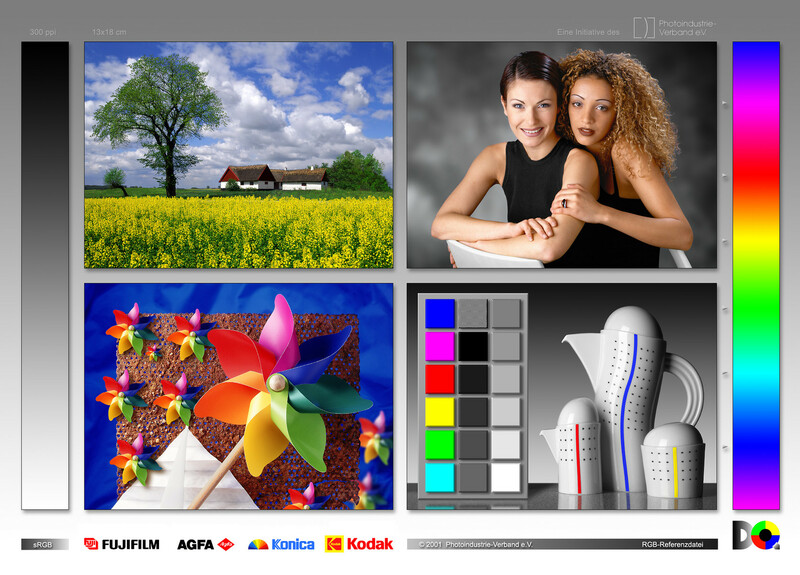 Horizontally, you'll quickly face reflections, which highly limit the legibility of the content. Alike all other new models of the Lenovo Thinkpad series also the Thinkpad SL500 is based on Intel's latest development, the Express PM45 platform, known as Centrino 2 or Montevina. 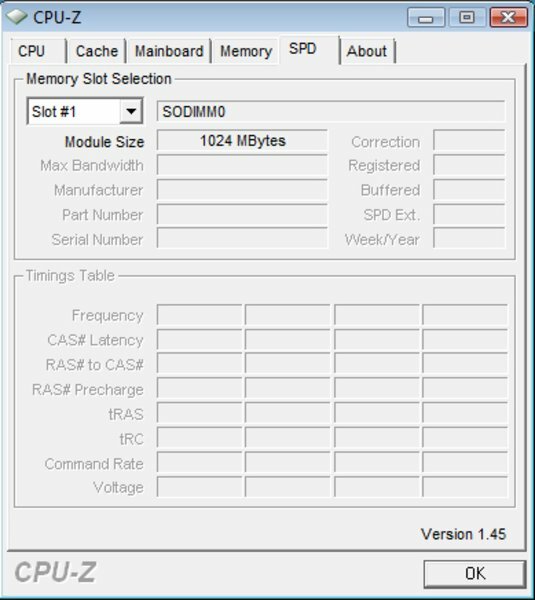 Therewith the SL500 can also be equipped with the most up-to-date hardware components, e.g., the up-to-date Intel Penryn processors. 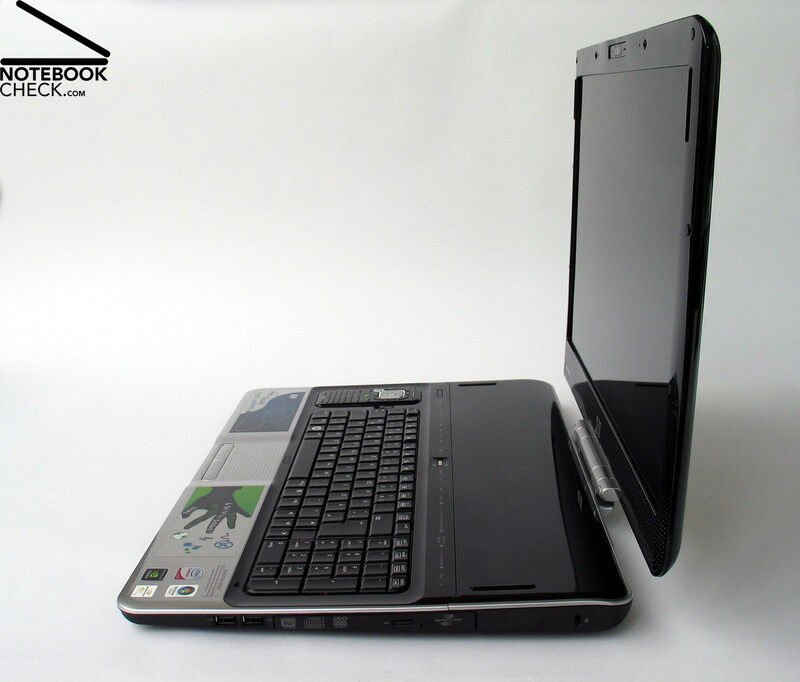 For the present Lenovo offers this notebook with the following CPUs: the T5670 CPU (1.8 GHz, 2MB L2-cache, 800 MHz FSB, 35W TDP), the T5870 CPU (2.0 GHz, 2MB L2-cache, 800 MHz FSB, 35W TDP), the P8400 (2.26 GHz, 3MB L2-cache, 1066 MHz FSB, 25W TDP), the P8600 (2.4 GHz, 3MB L2-cache, 1066 MHz FSB, 25W TDP), and as most powerful solution, the T9400 CPU with 2.53 GHz (6MB L2-cache, 1066 MHz FSB, 35W TDP). Regarding graphics the user can choose between two different options. A possible choice is the integrated Intel GMA X4500 graphics chip for the typical office user, who will profit from the lower energy demand and, therewith, from a longer battery life and the essentially lower price. If you merely want to run standard office applications with your notebook, this solution is recommendable. 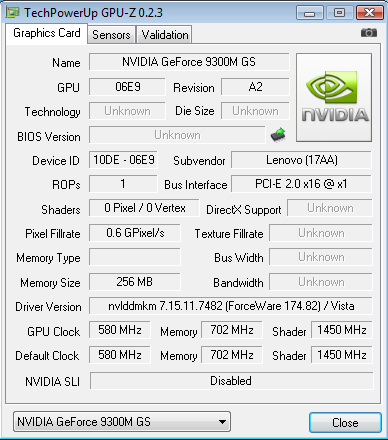 A dedicated Geforce 9300M GS graphics card by nVIDIA is also available for the Thinkpad SL500. Equipped with 256MB video memory this model of the SL500 is also fit for multimedia applications. 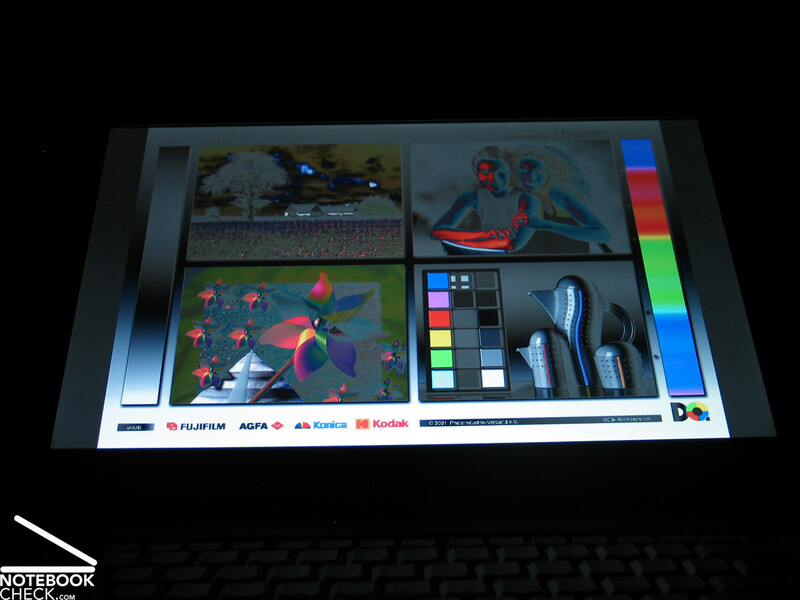 Possible applications are simple video editing or HD decoding, and simple 3D applications like, e.g., older computer games. 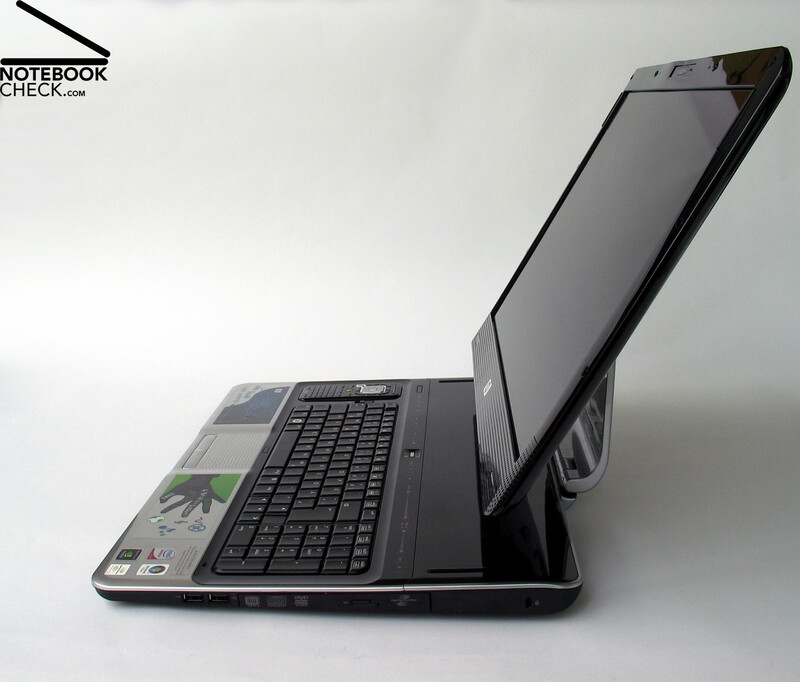 The test sample was equipped with an Intel Core 2 Duo P8400 with 2.26 GHz and with the above mentioned Geforce 9300M GS graphics solution. In total this notebook achieved 4413 points in the PC Mark 2005, which is an average result. 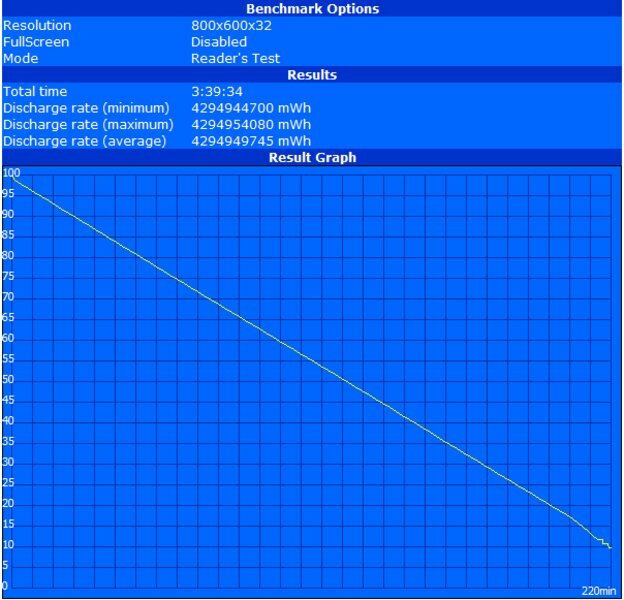 It is very interesting that the Thinkpad SL500 performs essentially better in the Cinebench R10 benchmark. 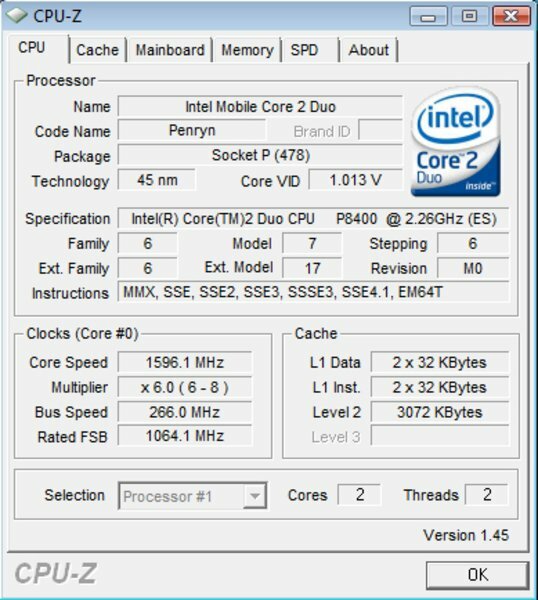 Here the Core 2 Duo P8400 CPU can convince by a good result in the rendering test, and reaches about the level of a T7700 CPU with 2.4 GHz. The performance of the Geforce 9300M GS graphics card in the Cinebench Shading test (OpenGL), is with good 2920 points also rather passable, and clearly better than other entry-level graphics solutions, like, e.g., the HD3450 by ATI or even the Quadro NVS 140M inside the already superseded T61. 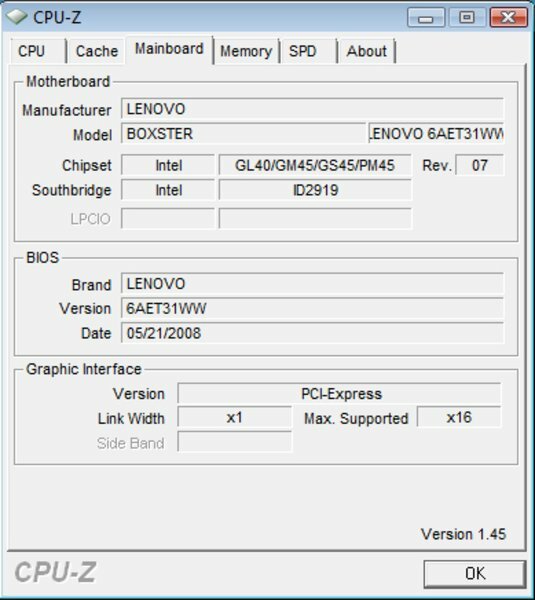 Our test sample of the Lenovo Thinkpad SL500 was equipped with a total of 2048 MB RAM. This conforms to today's standard configuration. 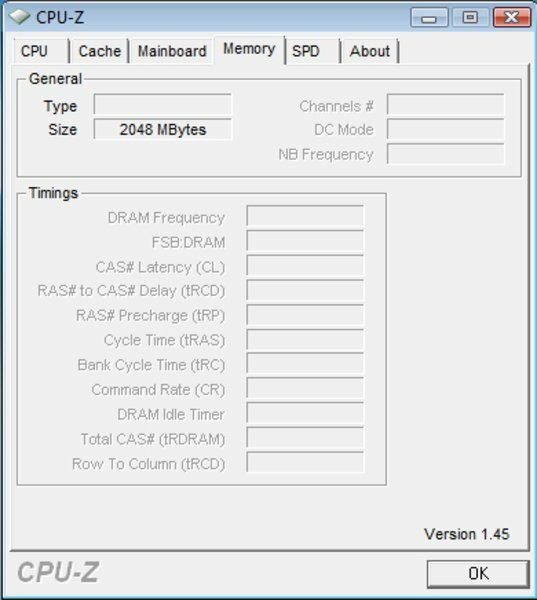 Two DDR2 PC5300 modules with a clock-rate of 667 MHz were used. At the first glance this is surprising, because the SL500 is already equipped with the new Intel Centrino 2 technology, which would also support the essentially more powerful DDR3 RAM modules. But, finally, the reason is quickly figured out: It's simple to keep the price low. The manufacturer's price of DDR3 modules is currently still essentially higher than of DDR2 modules. This is a point, which hints on saving and probably explains the PCMark 2005 result, which was not a typical Centrino 2 result. Also the built-in hard drive, a Hitachi Travelstar HTS542516K9S, is a reasonable mass storage device with only average performance. This component is with 160 Gigabyte, an access time of 18.2 milliseconds (5400 rpm) and an average transfer rate of 36.0 MB/sec clearly an entry-level component. 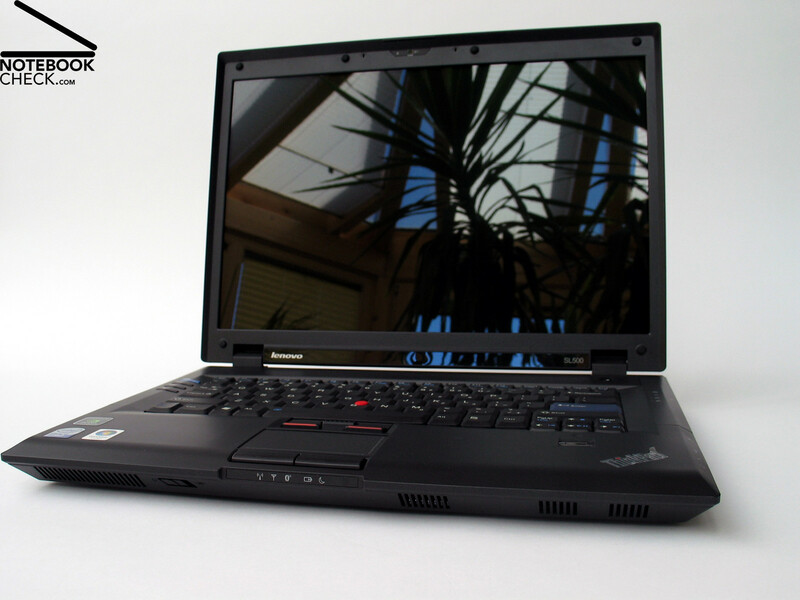 The Lenovo Thinkpad SL500 left a very positive impression in the test of the noise emissions. Although the system fan starts running shortly after power on, its measured noise level of 33.4 dB(A) is absolutely not critical and does not annoy at all. Measuring the noise level under load was nearly already difficult. But, not because of the especially high emissions. 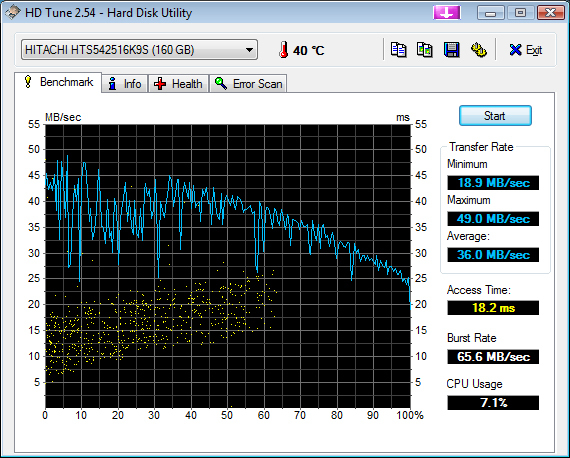 No, the reason was the very slow fan, which only increased its speed and stayed at this level after permanentely running the system under load for some minutes. The measured noise level of just 35.8 dB(A) is absolutely not critical and by no means disturbing. The surface temperatures of this notebook were very similar to its noise emissions. The temperature increased to a maximum of 35.6°C at the top side, which is an unremarkable maximum. The bottom side also gets only a little bit warmer, but at some parts we measured peak values of up to 39.7°C. (+) The maximum temperature on the upper side is 33.6 °C / 92 F, compared to the average of 33.9 °C / 93 F, ranging from 21.2 to 62.5 °C for the class Office. 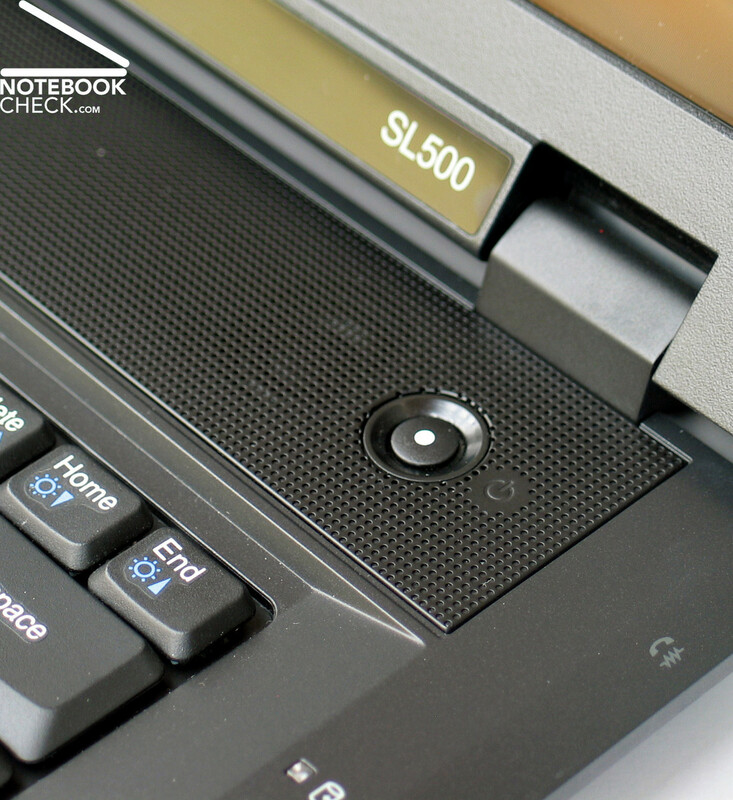 In contrary to a genuine business notebook, the demands on loudspeakers are rightly higher for the Lenovo Thinkpad SL500, because this notebook is positioned in between consumer and business notebook. In our sound check the two built-in loudspeakers provided a quite audiolicious sound. The maximum volume is appropriate for DVD and music playback. And also the sound quality is alright, although the sound could be a little bit fuller. In the test of the 3.5 mm audio-out we did not detect any abnormalities. 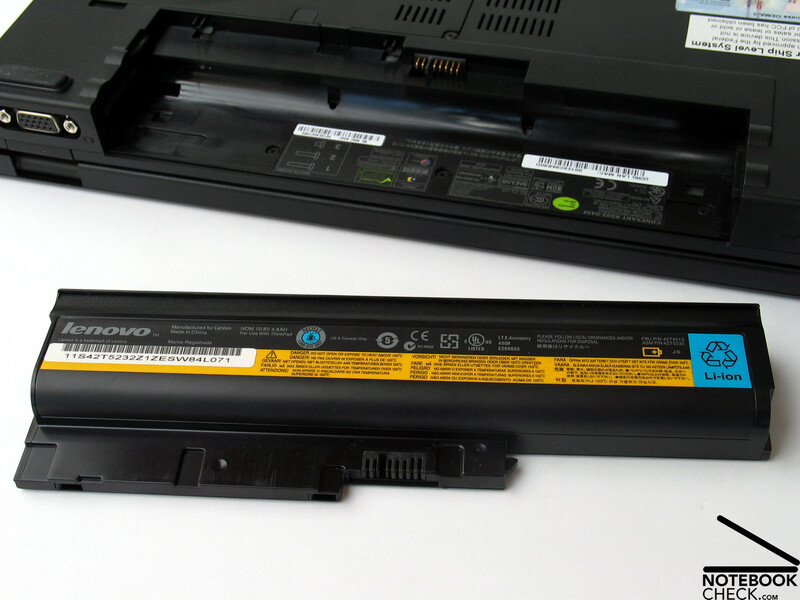 Ex factory the Lenovo Thinkpad SL500 is equipped with a 6-cell battery. Due to a capacity of 4800 mAh (51.8 Wh) it provides depending on the individual demands a quite useful battery life. In the test of the maximum possible runtime with minimum energy demand measured by the BatteryEater - Reader's test tool (Energy saving profile, min. 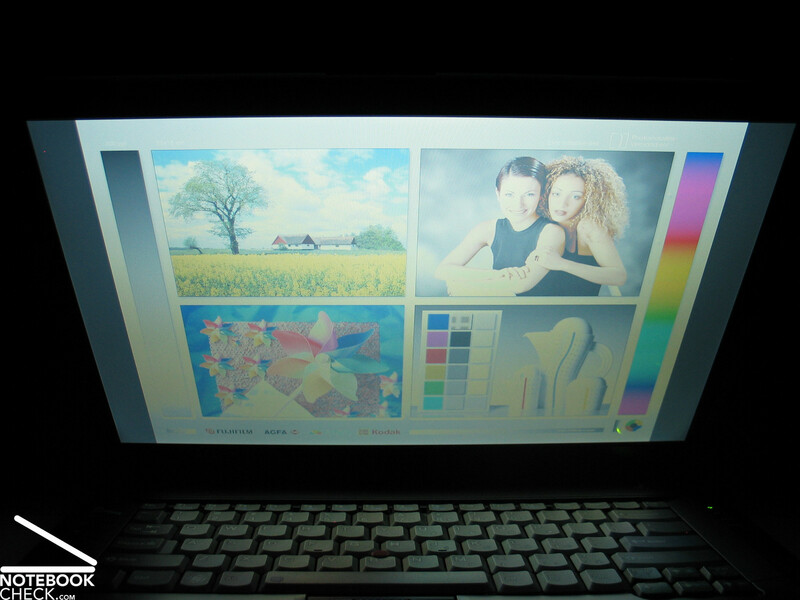 brightness, WLAN off) the notebook achieved quite good 233 minutes. 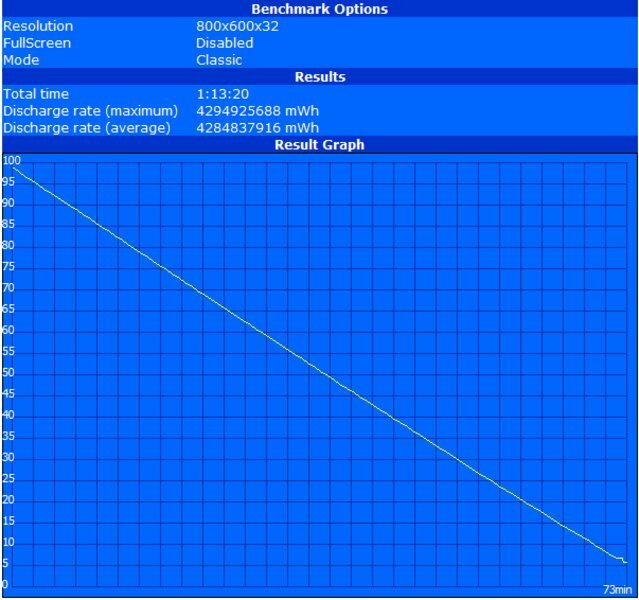 In the test of the worst case that is under load with maximum performance measured by the BatteryEater Classic test (energy profile peak performance, WLAN on, max. brightness), the battery life of the Lithium-ions battery was at least still 73 minutes. 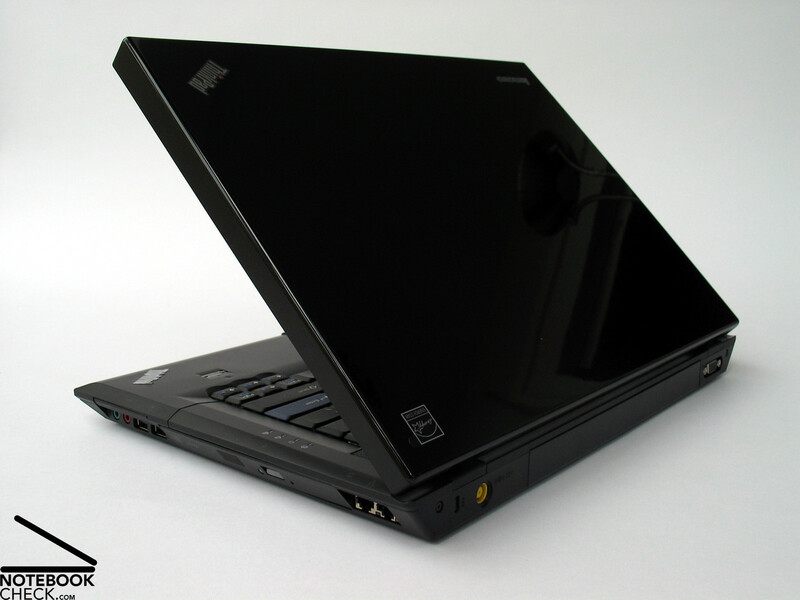 After the Lenovo SL400 now also the SL500 was to prove to what extent it conforms to the usual Thinkpad qualities. To summarize, you have to consider the big cost pressure in order to keep the entry-level price low. This gets, e.g., obvious at the case, which does not only look different, but also the used materials position it clearly as low cost model of the Lenovo line-up. The keyboard also differs from the models offered at higher quality. This is, e.g., true for the keyboard layout, which has a rather dense order and does not provide the key grouping typical for Thinkpads. Obviously all SL models come with identical keyboards, which further decreases the costs. Besides, the keyboard partly clearly gives and the space bar clatters, the SL500 can close up to the typing feel of the other models. 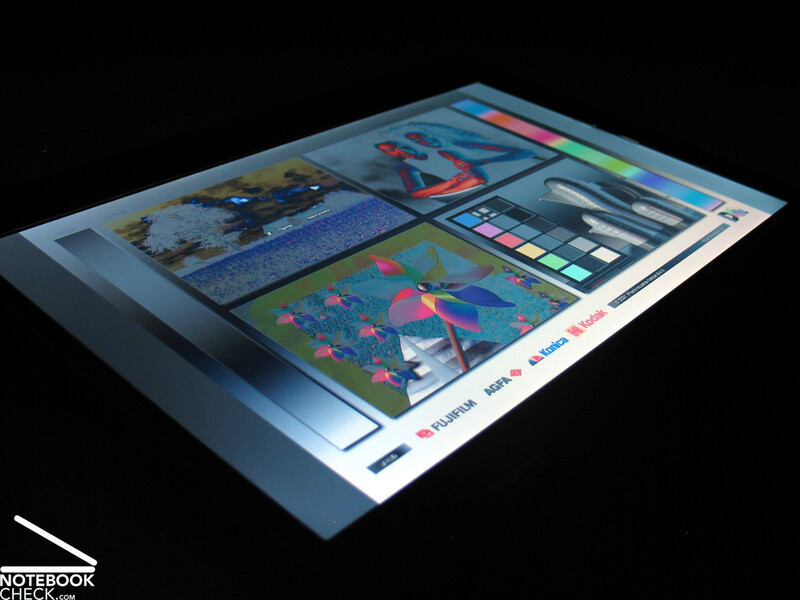 Our test sample was equipped with the probably cheapest display, a WXGA panel with reflecting display surface. This had an absolutely good brightness, weak points are its contrast and its viewing angle stability. 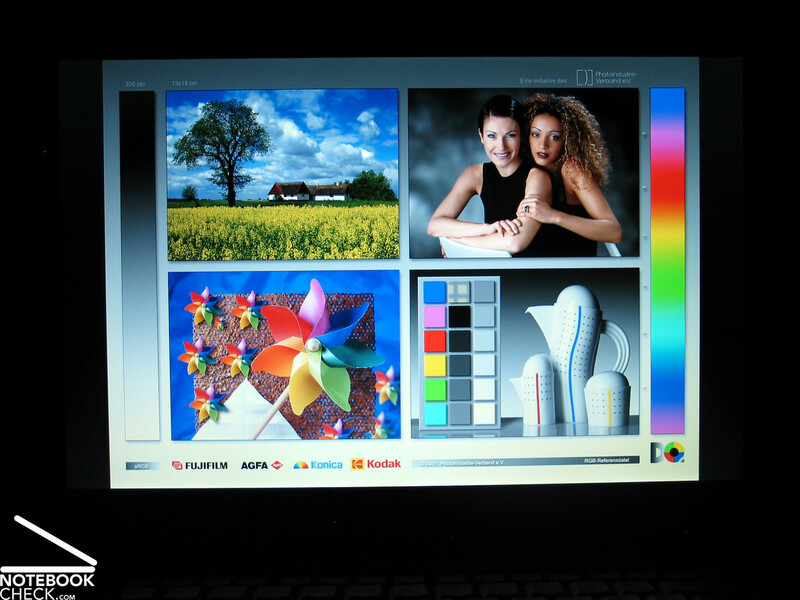 The also offered WSXGA with higher resolution and matte surface might probably be more interesting for office operation. The performance of this notebook is average. 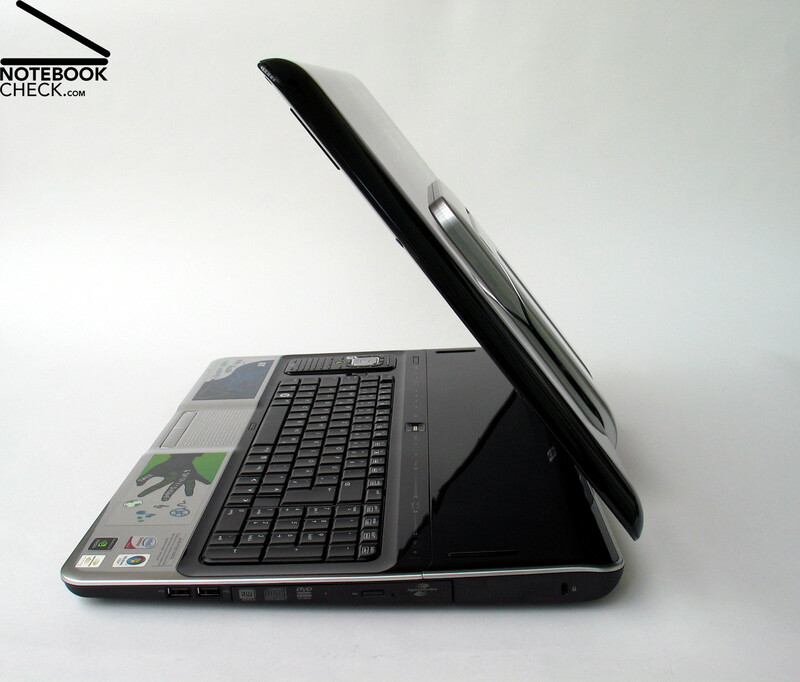 Depending on the selected configuration the SL500 is either more an Office (Intel 4500HD Grafik) notebook or, if equipped with more powerful components, a multimedia notebook. The available Intel Centrino CPUs ensure a good calculation performance. 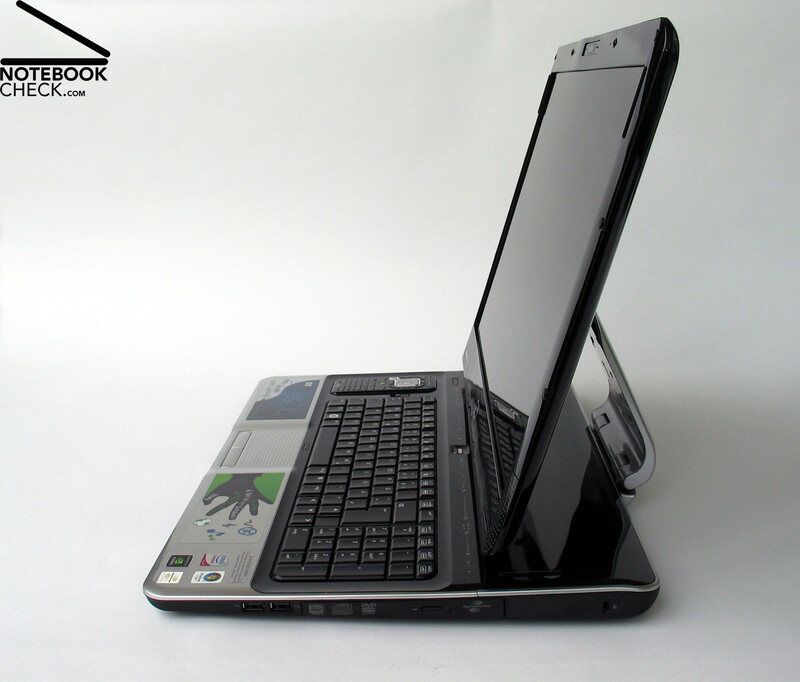 Depending on the selected components, RAM and hard drive can slow down this notebook, especially, because the design focus was on low cost. 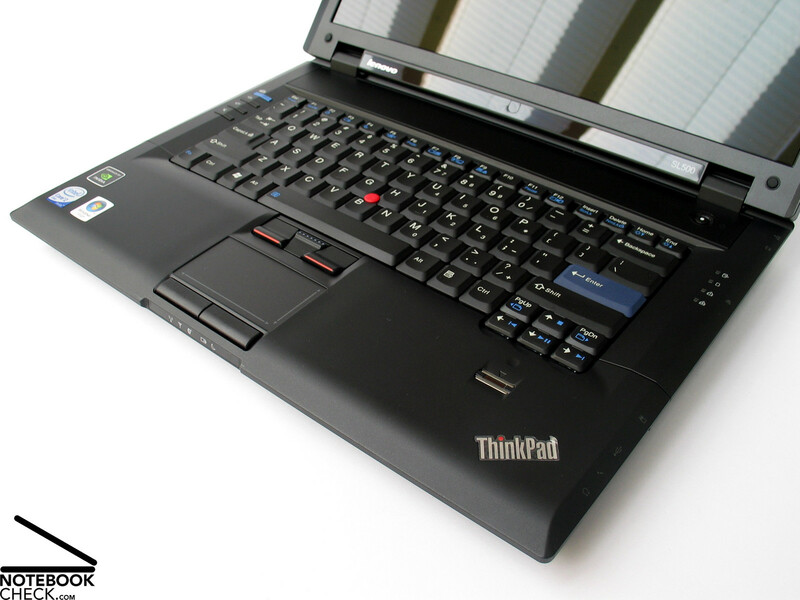 An advantage of the Lenovo Thinkpad SL500 are its very low emissions. This is true for the surface temperatures, which stay always alright, as well as for the regardless of load comfortable noise level. So, the SL500 can be recommended to price-conscious businessmen who look for an entry-level model for office applications, but do not want to completely miss out multimedia applications. 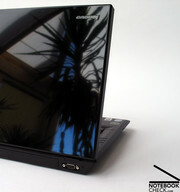 In these fields the SL series by Lenovo, which is not only equipped with built-in UMTS module, the successful Thinkvantage software, and HDMI, but can optionally also be equipped with Blu-Ray drive, scores points, whereas a low price is one of the most important arguments for the SL500. 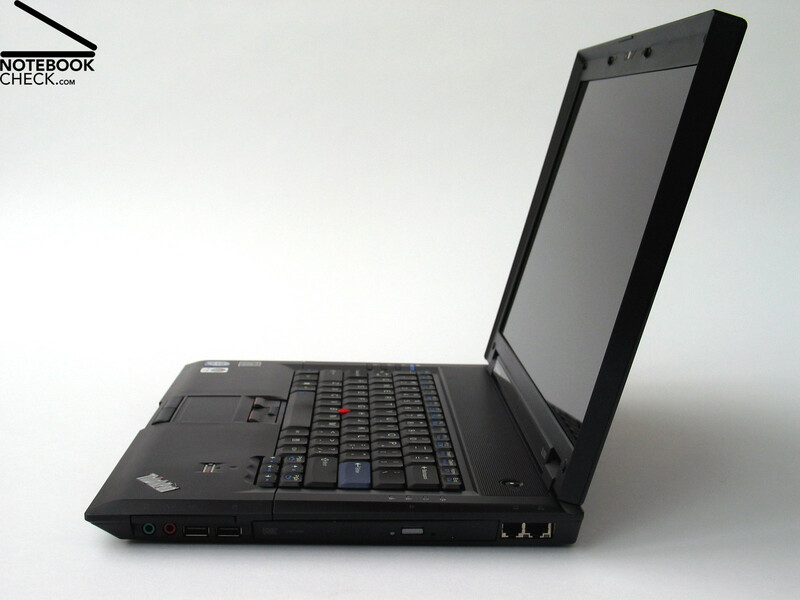 At the first glance the SL500 does not look like a typical Thinkpad, because it has reflecting high-gloss surfaces. E.g., the keys are closer to each other and weren't grouped in any way. 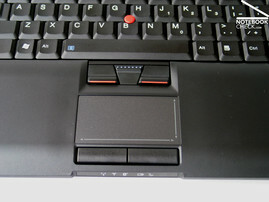 The typical Thinkpad hotkeys, which include volume control and the blue ThinkVantage button, are also provided. 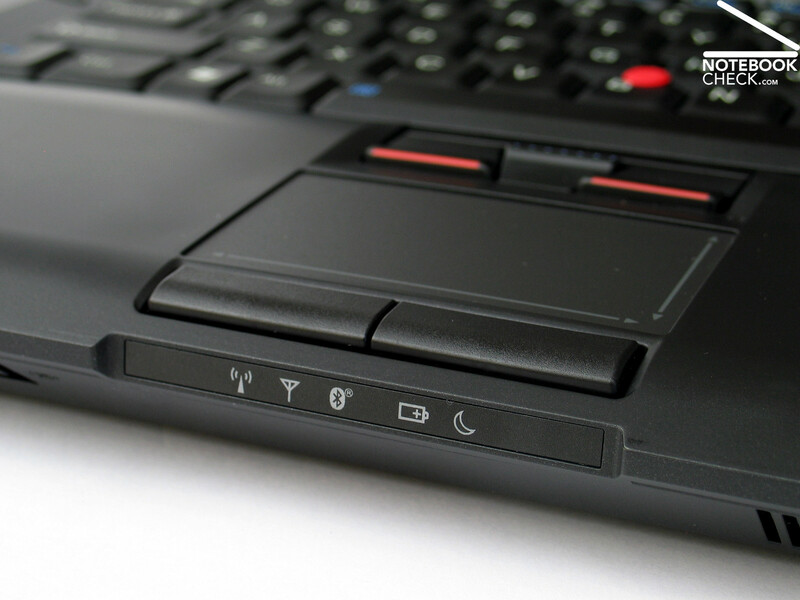 While the keyboard partly clearly gives, the touchpad and the trackpoint showed the usual Thinkpad qualities. You can either select a WXGA panel or a WSXGA display, which has a higher resolution. In the test the WXGA display with reflecting surface had a passable brightness, but only a mediocre viewing angle stability. 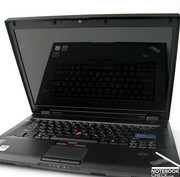 The Lenovo Thinkpad SL500 is, like all other new Thinkpad models, based on Intel's new 45PM chip set (Centrino 2). Equipped with a P8400 CPU by Intel and a Geforce 9300M GS graphics card, the SL500 can also be used for light multimedia applications. 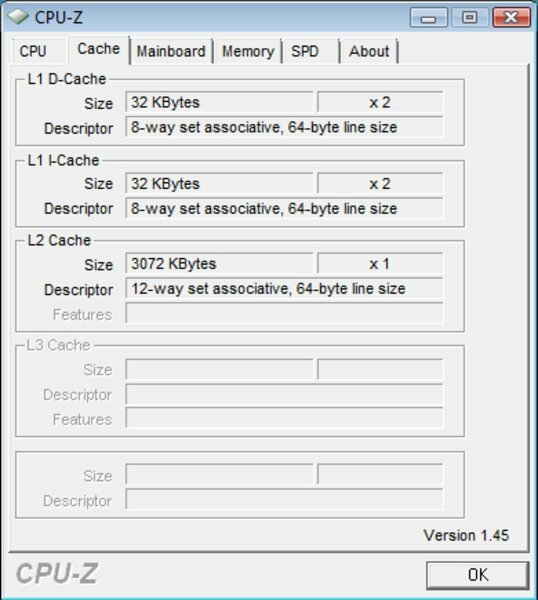 Obviously, it was saved on the built-in RAM, because the test sample was only equipped with DDR2 RAM modules, although the chip set would already support DDR3. The test of the fan has a very positive result. Even under load the noise level stays rather low. This is in general also true for the heating of this notebook, which is also kept within a limit. The sound of the speakers is reasonably passable and appropriate for watching DVDs. 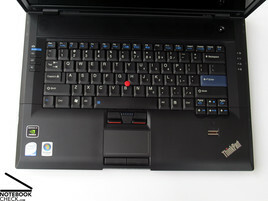 The layout of the keyboard differs essentially from the other Thinkpad models. The advantages of the SL series also include a pre-installed UMTS module, which allows a fast switch to broadband Internet access via UMTS. ...and to clearly distinguish it from the other models of the Thinkpad universe. ... e.g., a completely black case with a red trackpoint in the middle of the keyboard. 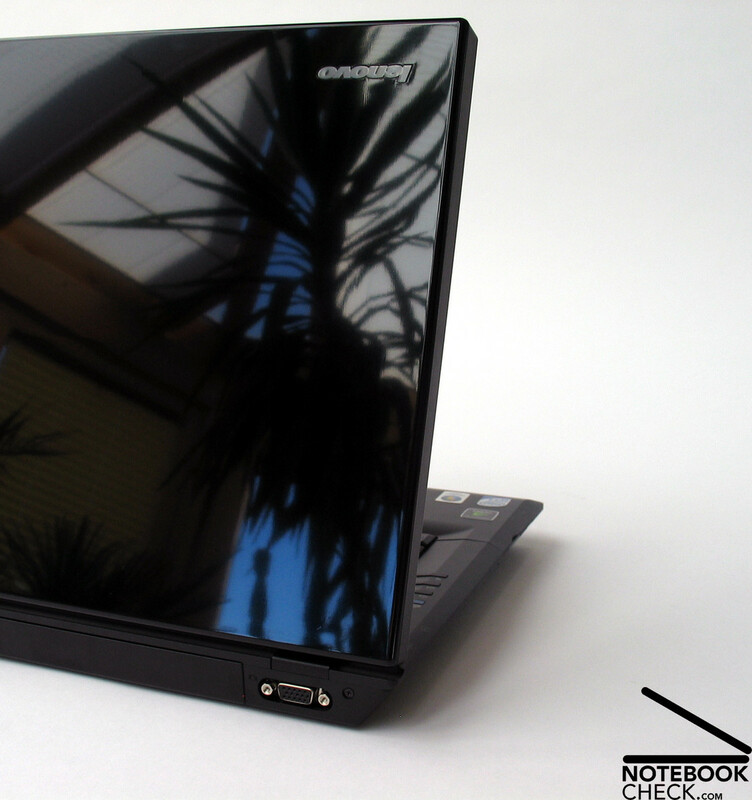 The Lenovo SL500 tries to look thinner than it actually is by a wedge-edged design. Although this was successful and the SL500 highly reminds you on the former R-models by IBM, this also causes problems. E.g., the interfaces located on the flanks are hardly visible from above, so, their use requires some sleight. The interface equipment is rather noteworthy, because it provides a total of four USB 2.0 ports, FireWire, and HDMI. ...you'll find out that they are still made of metal if you take a closer look. 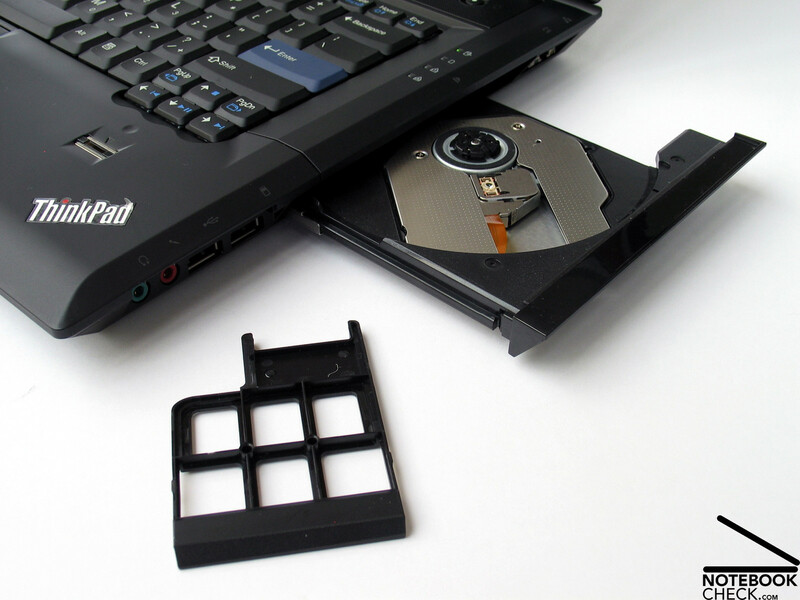 As an alternative to the usual DVD burner you can also opt for a Blu-Ray drive. 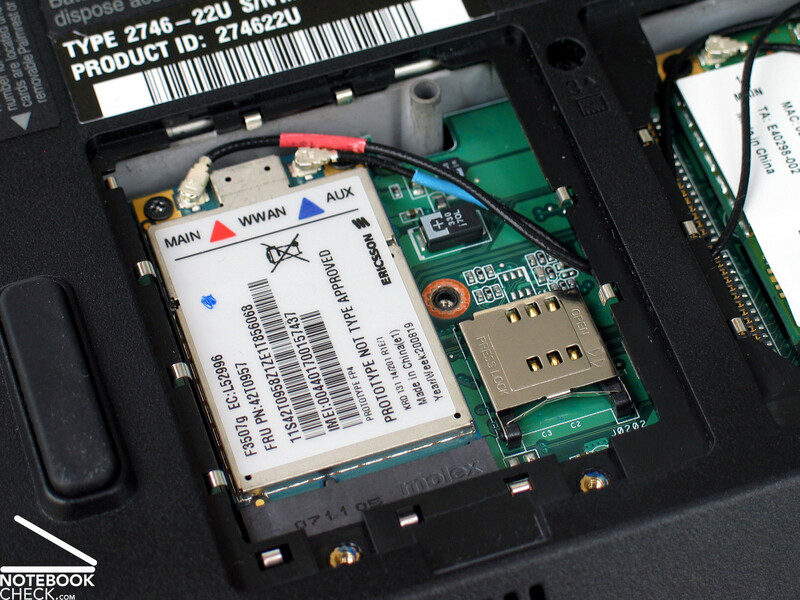 The standard 6-cell battery has a usable battery life of up to nearly 4 hours.